This fantastic DVD documents one couple’s bicycle journey across the country in search of a new home in a sustainable community. The intimacy and freshness of this film is a window into Mandy and Ryan’s lives. We witness their leap of faith, their vulnerability and hope that there is more to life than the corporate jobs and houses they behind. Instead, they gear up and set out on bicycles knowing that their new home awaits somewhere. They find adventure, friends and many challenges along the way. They also find that people can live sustainably and are living sustainably in communities all over the country. Viewers are bound to feel for Mandy and Ryan as they weather the trials and frustrations and savor the small victories along the way. After touring more than 100 communities and cycling 6,500 miles, they finally find a home. You can buy Within Reach at our bookstore for $25. 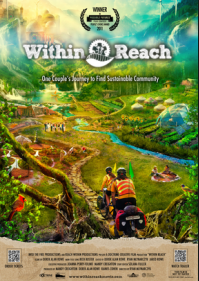 If you like Within Reach, chances are you’ll like Seeking the Good Life in America, another DVD documenting a journey to find community. S/H prices shown are for Standard Mail postal delivery within US.